Ive been out of the hobby forever (again), last time i seriously hobbied anything was back when Shadow War: Armageddon dropped and that was pretty much assembly lining the terrain from that single box. Before that it was again a couple of years since i hobbied or played, i got at most 10 games in during 6th, never got a game of 7th edition and still havnt played 8th. 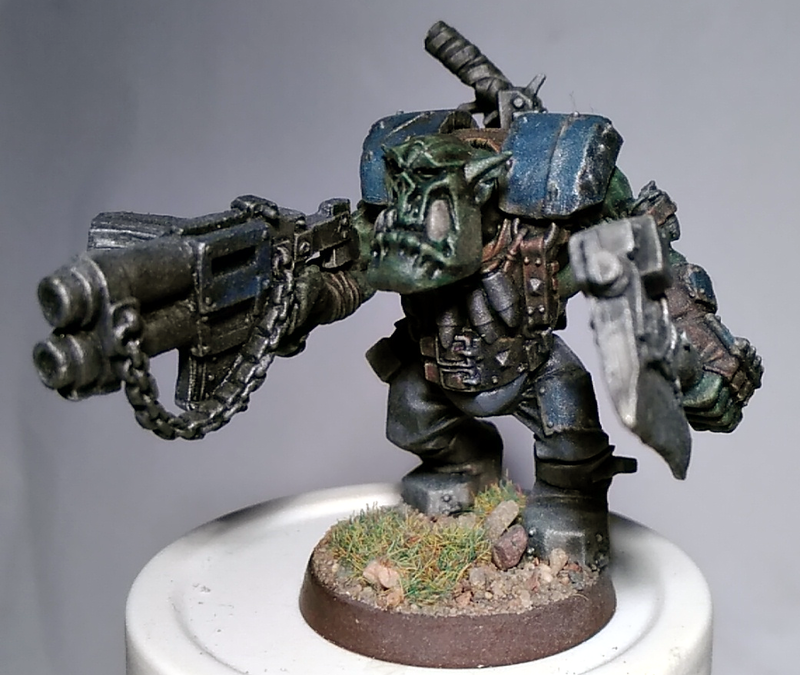 Im gonna try to get back into some of this stuff again but i thought i might share the last Ork i actually painted, this guy is the Nob i build for my Shadow War: Armageddon mob so its from the first third of 2017 somewhere. Current Nob kit body, head and stowed gun, old metal nob choppa and kustom shoota because the current kit doesnt have any kustom shootas that are held one handed. Im gonna start by figuring out a Gorkamorka Mob and building it up from new models, basing to fit the desert. This is because most of my painted orks are on goblin green bases topped with sand so its sorta off to just pick models from them. My intent is to make a desert terrain board for the Gorkamorka stuff, classic rock outcrops, maybe a fort. Here is the mat and terrain ive made over these past five days, plus a previously painted battlewagon for scale. I really like those rocky outcrops. I've tried to build them before, and never been able to get them quite right. Thanks, i didnt really have an idea of what i was doing, the videos i looked up in preparations said to just carve all corners off and go from top to bottom for the striations. These really came great. Since I don't play the game scenery is a big deal for me since it gives the display so much more depth. No one wants to just see them all sitting on shelves. I've always been a big fan of this foam stuff. I thought it was hilarious you built your own cutter, that was awesome. Very orky! 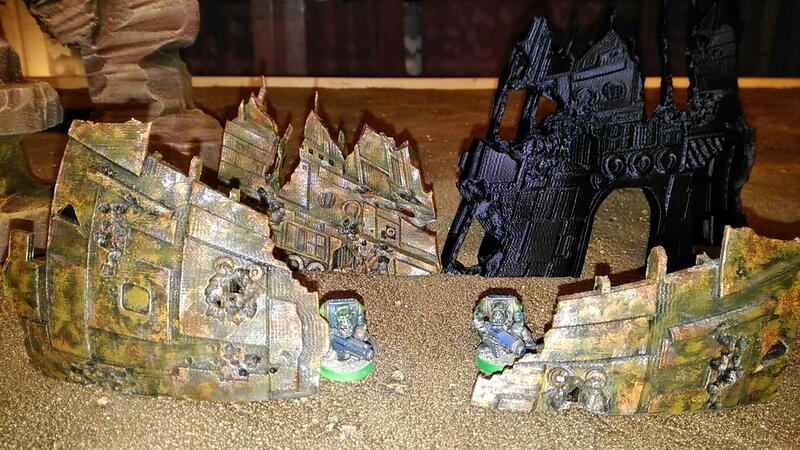 I painted up three 3d printed pieces of wrecked space ship (while the fourth was printing) last night, i might base these and have some rubble jutting up around them for stability and to sorta blend them into the table more. And ive always played on grass tables, the only exception being the two games i had at Warhammer World when i visited in 2016. Ive always wanted a desert board, now i have the "ground" and some basic terrain, im going to be 3d printing, texturing and painting some modular hills i found on thingiverse to fit with the rest of this and im also gonna make/print some scatter terrain. The big project will be a fort with accessories that can be used for Gorkamorka, as well as any other scenario with need of Orky terrain. As for the cutter, I saw an example of how to very easily build one on the Flitetest channel on youtube and thought it would be a great addition to my tools, ordered the parts and just had them sitting around for a long time till i got this burst of restlessness so i whacked one together. You could just calculate and measure out your wire for use with a set amount of regular regular batteries but this is easier since there is no need to be precise about it, if i need hotter i can just turn a knob till the wire glows if i want. Its also great for cutting through 3d printed stuff.